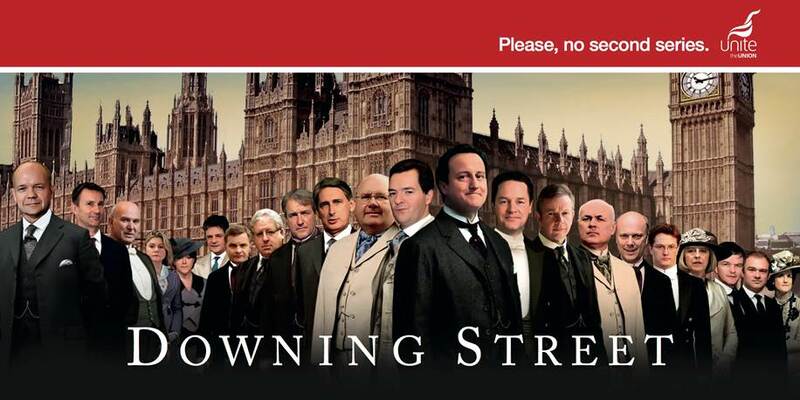 Unite have released a poster which attacks the upper class hierarchy of the Coalition Government. It was created by TBWA\London and is live on a digital billboard carrying van, which is being driven around Manchester during Conservative Party Conference. The poster emulates the promotional material for ITV’s period drama ‘Downton Abbey’. The heads of the cabinet have been superimposed on the bodies of characters from the show. Conservatives have taken the place of members of the Crawley family with the Liberal Democrats as their servants, with the deputy prime minister, Nick Clegg, as the head butler.